If you’re finding it hard to find suitable Childrens Clothes Hangers you’ve come to the right place! 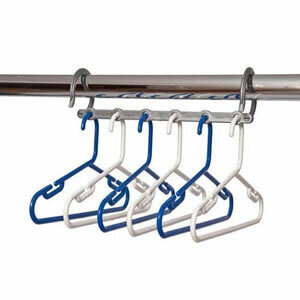 With a massive choice you won’t find anyone who has a wider choice of Clothes Hangers than Caraselle! From Children’s Expanding Skirt Hangers, Childrens Huggable Hangers, Childrens Padded Hanger, Childrens Plastic Hanger with Swivel Hook, Children’s Wooden Hangers….and that’s just the beginning! Looking for some extra space and a great childrens hanger? Available in Pink or Blue, these brilliant hangers are unique to Caraselle. With each pack containing 1 x Silver Space Saver Hanger Bar & 6 x childrens polypropylene hangers (3 x blue or pink & 3 x white). The hangers 33cms wide (13″). You can really maximise your children’s wardrobe space by hanging 6 garments in the same space as 1! 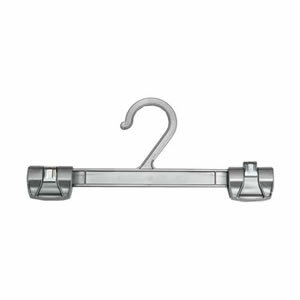 This space saving overdoor hanger is perfect for hanging your children’s clothes when space is short in the wardrobe. It also brilliant for many other uses! Such as being ideal for use when ironing. It will fit doors up to 4cms and the hanger protrudes from the door by 3.5cms (5 1/2″). From only 80p! Loved the hangers, just what I wanted, hence the reason this is my second order. Great product, very handy for the kids trousers. Not expensive also.